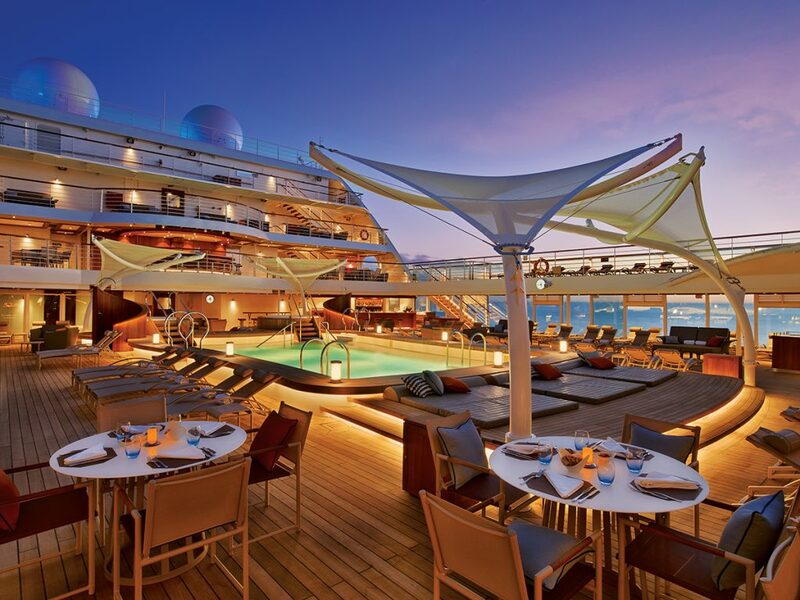 Seabourn’s newest deserves a big round of applause. Singapore is no Miami or Barcelona when it comes to cruise ship traffic, so when I heard that Seabourn’s brand-new 600-passenger Seabourn Encore would be in town — my town for the past 11 years — I was thrilled. Docked at the ultra-modern Marina Bay Cruise Centre, a funky two-berth terminal designed to look like breaking waves, the stern of Seabourn Encore faced Singapore’s downtown skyline, colonial core, and the iconic Marina Bay Sands hotel, which consists of three towers connected by what looks like a giant surfboard on top. Seabourn Encore was in Singapore in early January for her official christening by soprano Sarah Brightman before departing on her inaugural sailing to Indonesia. Following her maiden season in Asia, Australia, and New Zealand, Seabourn Encore will spend summer 2017 in the Mediterranean on 7-, 10-, 14-, and 20-day cruises out of Piraeus (Athens), Greece; Civitavecchia (Rome), Italy; and Barcelona, Spain. In mid-September, she’ll head east again through March 2018, before summering again in the Med. I walked on board, breathing in that fresh new-ship smell, and started wandering around Seabourn’s first new ship in five years. It was built on the same platform as the line’s three previous ships (Seabourn Odyssey, Seabourn Sojourn, and Seabourn Quest), but with one more deck. Seabourn Encore felt spacious and I couldn’t help noticing the preponderance of soft, undulating lines, in contrast to the somewhat sharper edges and cool tones of Seabourn’s other ships. Nowhere is this more evident than in The Grill by Thomas Keller, a favorite space on the ship and one awash in warm colors and sensual curves. At the entrance is a circular glass wine room taking pride of place. To the left is a classy bar area with polished mahogany wood accents, rounded glass lighting fixtures and chairs, and curvaceous red sofas that set the tone for the entire glamorous room. It’s understandable why The Grill requires reservations. Who wouldn’t want to spend as much time here as possible, not only for the classic American steakhouse fare — chops, Dover sole, Lobster Thermidore, and tableside Caesar salads — but for the lovely décor as well. Seabourn Encore’s designer, hospitality design icon Adam D. Tihany, was aboard the inaugural cruise and explained that the previous Seabourn ships were more Nordic in style and that he was going for something more Italian with Seabourn Encore. In fact, the Odyssey class was designed by Norwegians, Yran & Storbraaten Architects, while Romania-born Tihany is American and studied architecture in Italy. “I wanted Seabourn Encore softer and sexier, with more colors and curves,” Tihany said. And this mandate is evident in nearly every inch of the ship, from the shape of many objets d’art (metallic spheres and porcelain urns) to the tiered arcs of open deck at the stern and the seven-deck corkscrew atrium anchored by a smooth amorphous sculpture made of green Murano glass. The oblong food stations in the buffet restaurant and the elegant furniture in the suites are all bereft of corners, and you’ll even find circles woven into the carpeting of the corridors. Seabourn Encore’s extra deck provided Tihany with the leeway to create a few brand-new areas the previous three ships don’t have, most notably The Retreat at the top of the ship on Deck 12. This exclusive sanctuary area has a ring of 15 private cabanas, each with a pair of chaise lounges and a large TV, facing in toward a central hot tub. There’s also a bar, spa cabana, and food and drinks service. The Retreat comes at a price of $349 per suite on sea days. For other escapes, you’ll also find there are quiet, private-ish spots all over the ship such as a secondary pool area with loungers aft on Deck 5 (the main pool is on Deck 9). As on the rest of the fleet, Seabourn Encore’s hub is the popular Seabourn Square, which includes a coffee bar, library, computer stations, and guest services. On Seabourn Encore, the space has been smartly redesigned for a much more open feel. The placement and shape of the curved concierge desks, banquettes, chairs, and bookshelves create a more natural flow and make the area bright, welcoming, and easy to navigate. The Restaurant, Seabourn Encore’s main dining venue, has also been given a new softer look, with arching columns and a vaguely Art Deco look. Besides these new, notable surprises, Seabourn Encore also includes traditional favorites as well, which is what Seabourn’s huge repeat following wants. Seabourn fans will be glad to find their favorite spaces and amenities on Seabourn Encore, often in the exact same place, from the solo hot tub at the bow for a front-row soak with views to the plush suites, all with balconies, walk-in closets, and marble-clad bathrooms with double sinks. 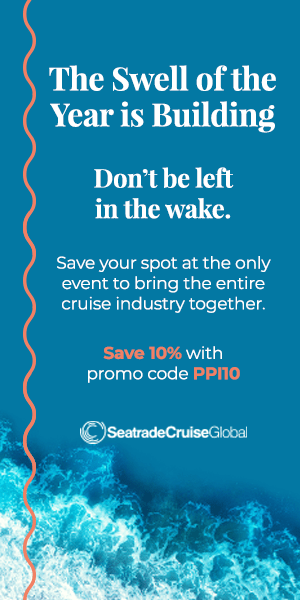 Like Seabourn’s Odyssey-class trio, Seabourn Encore features a watersports marina for kayaking, pedal boats, and windsurfers, and an impressive spa and gym with a fleet of sea-facing treadmills and cardio machines. A new twist is a wellness program created by the renowned Dr. Andrew Weil, which includes meditation and yoga classes and seminars based on his writings and research and conducted by certified wellness guides. With sister ship Seabourn Ovation scheduled for delivery in spring 2018, there will yet another star taking the stage. Bravo, Seabourn, bravo.